Breakbeat Paradise have been a on a serious roll over the last year or so, consistently delivering us the freshest Breakbeat originals.They continue this theme here with great success as Electrogorilla unveils 9 new creations, all laced with energetic drum work and smart sampling to draw out that nostalgic feel we all love about Breakbeat. 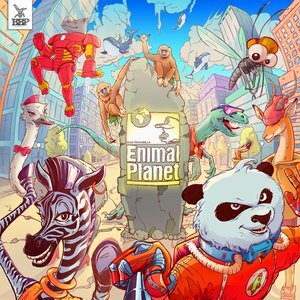 From the classic electro synth rolls of 'Electrhino' and 'Mosquito Lullaby' to the more eye opening, aquatic sounds and sharp percussive inputs of 'Killer Whale Odyssey', 'Enimal Planet' one holds something for everyone. Our highlights include the niche grooves and grizzly bass tones of 'Lazer Panda' alongside Shinder and of course the spacious ambience of 'Zebra Tribe'.